Whenever we have a fifth week, the challenge is 'Anything Goes'! 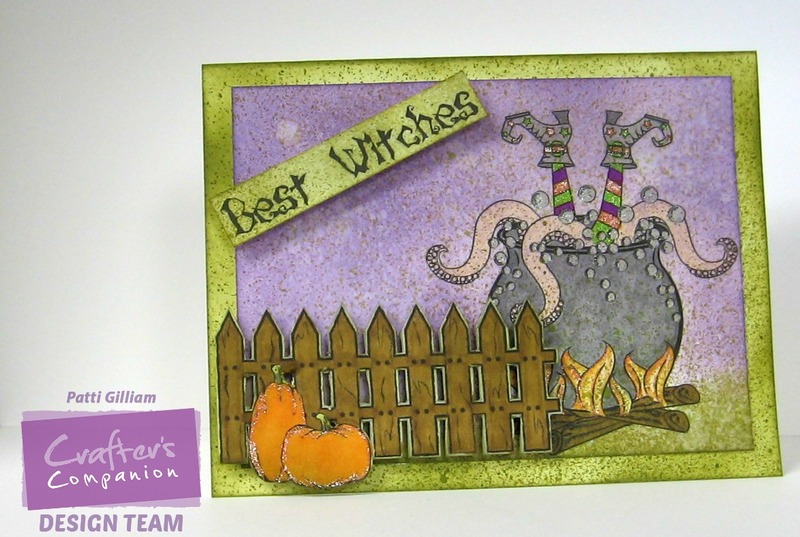 Halloween is just around the corner, so I created with some really fun little spooks! Isn't this little card darling? Two of the ghosties are popped up with dimensional foam. Love these little guys, and they are SO inexpensive! I'm entering this card into some challenges this week! Forecast looks gloomy and wet again...sigh! Here is another fun Halloween card that I created with products from Crafter's Companion. Not sure who will receive this one, but hope they like it! then popped up with some foam dimensionals. Lots of sparkle too! 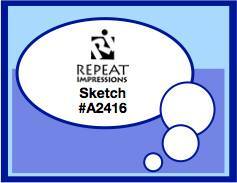 This was a fun sketch - hope you will play along!!! and stay ahead of the yard mowing. Made a card yesterday for someone at church, and thought I'd share it. The digital image is from a beautiful set by MHK Designs, called 'Birds and Branches'. card quite nicely. I think our friend will like it. 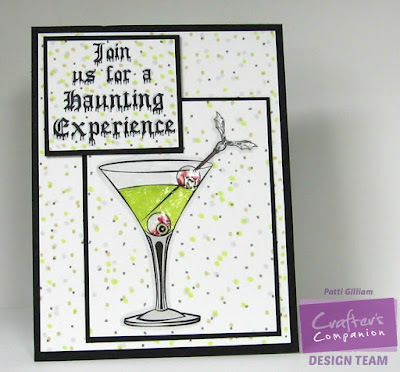 I'll be entering this card in the monthly challenge at MHK Designs. Their challenge is always either to use their photo/color inspiration, or if you use MHK Designs images, it's anything goes! You should totally check out Mynn's lovely digi images! Well, you know me...these scenic photos are the toughest. The photos are so beautiful, but I have total brain freeze when working with one. the panel was mounted onto a black card base. A few pretty 'blings' finished it off. Thanks for your patience with me the past couple of weeks. and his family had business in DC area, so we were able to see the whole family! We even had a family photo session, which I hope to share with you later. and thought I'd dash in just under the wire with a card for the August challenge. Hope you are all doing well, and that your weekend is much drier than ours is! It's been another rainy week here - ugh! 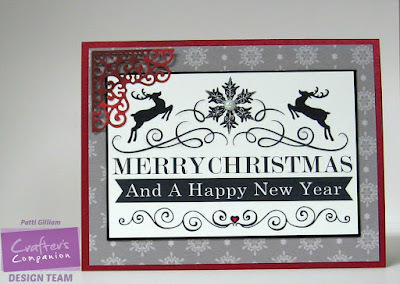 I have a pretty Christmas card to share today, using products from Crafter's Companion. This image just stands alone - no need for much of anything else! And look at that beautiful corner! You're going to be seeing these corners in future posts! There are four different and gorgeous corners in this set! 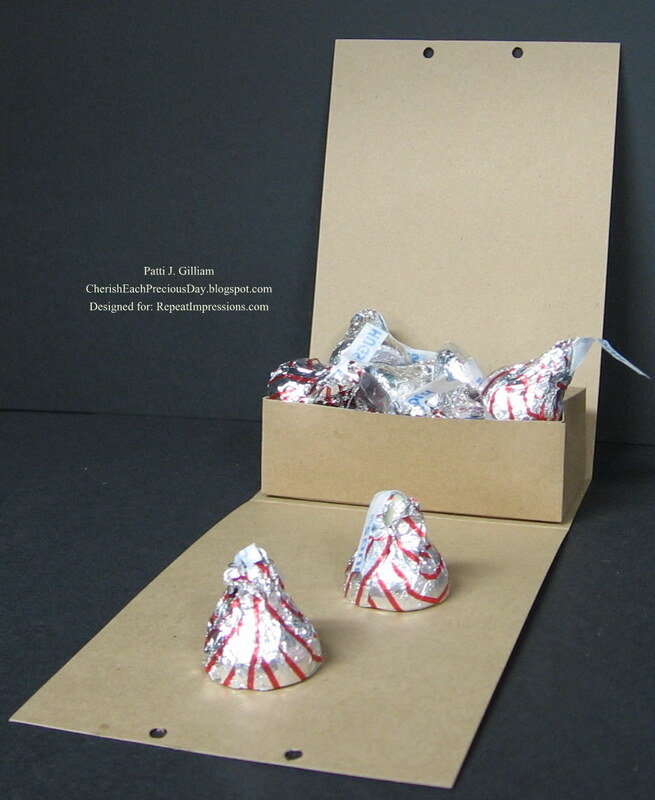 Feel free to click on the photo to get a better idea of the detail in this corner die! 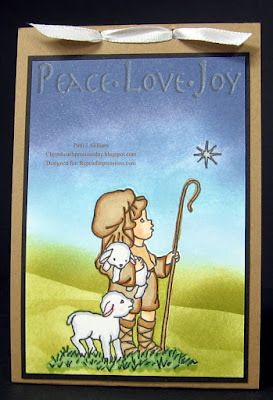 I'm not sure who will get this sweet card, so for now, I haven't added a sentiment. However, there IS a darling sentiment that you can find HERE at Repeat Impressions. It says 'Thank You... You're an angel'. 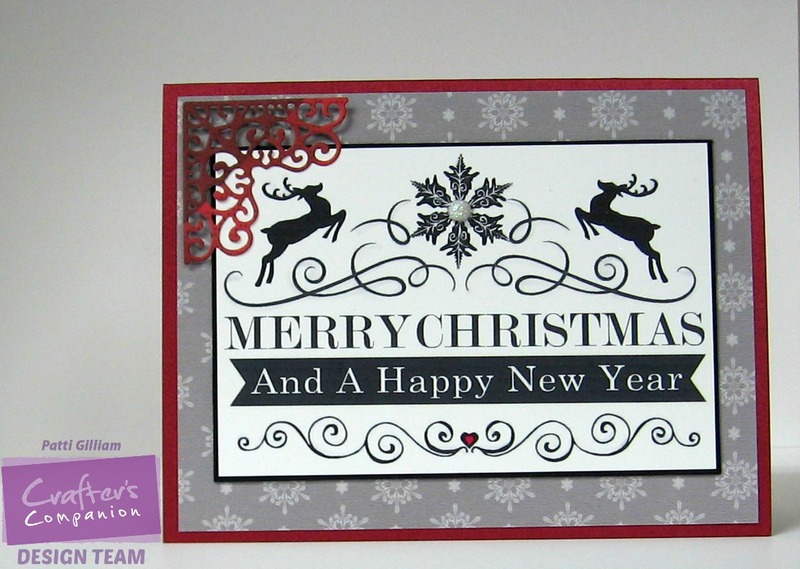 We hope you will create a card that has a focus on the DCC theme, ‘Create a Circular Card', and enter it in our challenge at The House that Stamps Built! Remember, your creation does not have to be made with Repeat Impressions stamps, but if you would like to include our designs we would love to see them! Plus, there’s an added bonus… you will get an additional entry in our random.org drawing for using our stamps in your submissions! It's Friday, and another weekend is right around the corner! 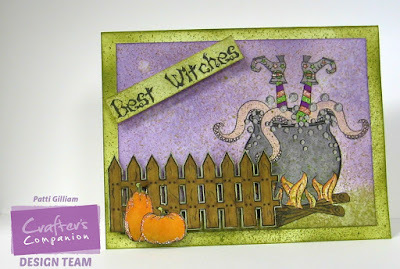 Here's a fun Halloween card, using products from Crafter's Companion. I'm almost out of my fringy edging - time to buy some more Baby Bell cheese!!! This edging is actually the bag that the cheese comes in - yes, I do hoard things!